Welcome To Our New Receptionist! When you phone or visit our offices in Shenstone Wood End you will be greeted by our new receptionist Lisa Arnold. 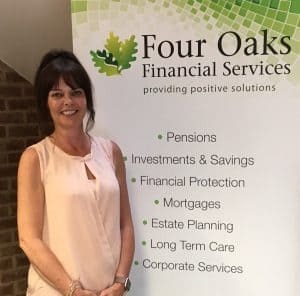 Lisa was a senior bank clerk at HSBC, she has also worked for Debenhams and run her own business being responsible for client support and accounts. All very relevant experience for her varied role as part of our busy team. Lisa’s role includes providing PA support to our Practice Manager and our MD, as well as first point of contact for incoming telephone calls, professionally and warmly greeting clients and giving administrative support to colleagues. “What I like about working at Four Oaks is the friendly people, happy environment and how everyone gets on as a team.” Says Lisa. In her spare time Lisa loves music and playing the piano and you might also see her mountain biking on Cannock Chase. Welcome to the team, Lisa! We recently took time out of our personal schedules and spent a Saturday packing essential items into Buddy Bags assisted by the children of the Four Oaks staff. Our task was to pack 200 Buddy Bags with essential items for children who find themselves having to leave everything behind to escape domestic abuse. The children often find themselves in a women’s refuge with nothing but the clothes they are wearing and you may be shocked to learn that 48,000 children need emergency accommodation in the UK each year, and by supporting the Buddy Bag Foundation we are helping these children at a very difficult time. “The Buddy Bag Foundation is our charity and we wanted to support them in a practical way by packing the Buddy Bags as well as providing funds through our fundraising initiatives.” Said Lynsey Dyche, Practice Manager. “We had a great time packing the Buddy Bags with things like socks and toiletries and we were very pleased that our own children could come along and help too. We will be doing another Buddy Bag pack later on in the year.” For more information about The Buddy Bag Foundation click here.